With the current RBA cash rate at an all-time low of 1.50%, clients are feeling the hit on their income levels and have been for years. In order to maintain their lifestyle, some investors are searching for a better yield on their portfolio with low risk. Even though rates are at all-time lows, the market is currently pricing in no rate movement until the end of 2019. Some economists are even suggesting no RBA cash rate movement until 2020. Investors are asking how can they get more out of their portfolio, without going into risky investments? In this article, we compare what investors are currently getting in term deposits, to what they can get if they were to invest in one of the XTB recommended portfolios, the Concentrated High Yield (CHY) portfolio (also known as the High Yield starter pack), to see if the extra risk is worth the squeeze. XTBs provide access to investment grade senior bonds. Investment grade senior bonds are slightly more risky than a term deposit, but like a term deposit, mature and have set coupons. Term Deposits may enjoy the benefit of protection under the Financial Claims Scheme. A benefit of XTBs is that they are traded on ASX and therefore are a more flexible product. Because they are traded on ASX, you can sell at any time for a full or partial amount, getting the proceeds in your bank account in two days. Term deposits can have break clauses, such as needing to provide a notice period for breaking a term deposit (31 days), which may incur fees. You can see from the table above that the average term is 5.70 years. However XTBs in your portfolio start to mature from 2022 or in four years’ time. Let’s have a look, based on current and projected rates (see below discussion on these projected rates), to see what the difference is between owning a term deposit and reinvesting each year into the CHY portfolio. 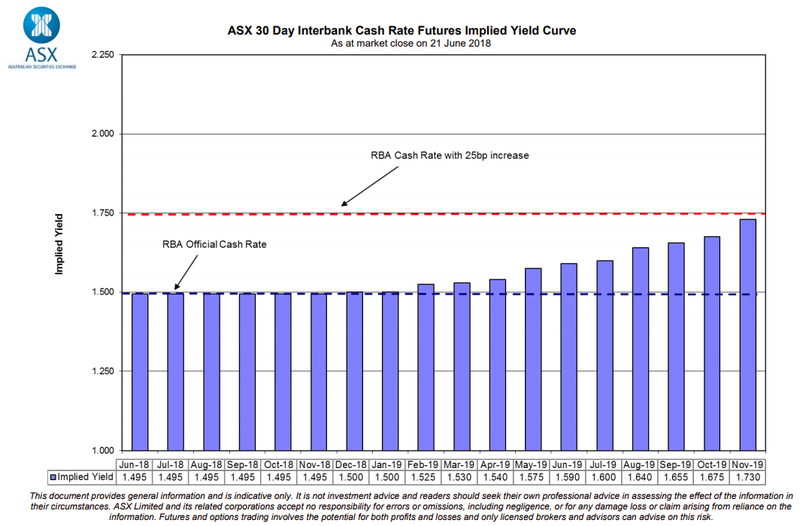 In the table below, we have assumed the term deposit rate will move in line with the RBA interbank cash rate futures and the government 3 and 5-year bond levels. The CHY portfolio will stay at the same yield to maturity throughout the term as the portfolio is set when an investor purchases the portfolio. Given the current expected rate movements of the RBA and government bond yield, the CHY portfolio would provide an investor a better return per year until 2022. This is when the term deposit rate would be higher given the assumed rate increases. However, if you take into consideration the accumulated total of outperformance / return over the previous 4 years, the CHY has a 1.60% better return over that timeframe. Also, the benefit of the XTB portfolio is that you have XTBs maturing at $100 face value. In the CHY portfolio you would have 2 XTBs maturing in 2022 and 1 XTB maturing in 2023. The investor would then be able to reinvest these maturing XTBs into another new XTB. Taking into account the 1% cash rate increase over the period of analysis, it is reasonable to assume the investor would be able to invest in another XTB with a better yield to maturity in 2022 and 2023. This would mean that the CHY portfolio is likely to continue to outperform the term deposit strategy, as the overall return is likely to be greater than 3.37% pa.
XTBs help provide predictable returns for investors. They also have a similar pay-off profile as a term deposit – return of capital and set income payments along the way. This analysis is obviously a very simple approach. We used forecast tools such as the RBA cash rate futures and the government bond rates. As you can see from the results, the outcome is quite compelling. The RBA cash rate and government bond yields are below. An investor can get a term deposit of 2.50%. This is a standard rate I hear from many brokers and advisers. No reinvestment has occurred in respect to TD returns, notwithstanding that bond yields assume reinvestment of coupons.